The Mares Air Control Inflator replaces the conventional BC power inflator and second stage octopus by combining the functions of both into a single unit. When you're taught how to dive you are given practice in buoyancy control more than any other skill. Once you start to dive every time you go underwater, fin the reef, or surface you use buoyancy control. All this time your octopus second stage regulator hangs un-used and out of mind. When a real life out-of-air situation occurs, the stress and anxiety mounts, and you find yourself fumbling for a piece of equipment you never use the Octopus! Combining your inflator devise (that you use on every dive) with your octopus Regulator assures your ability to react properly when an out-of-air emergency occurs. 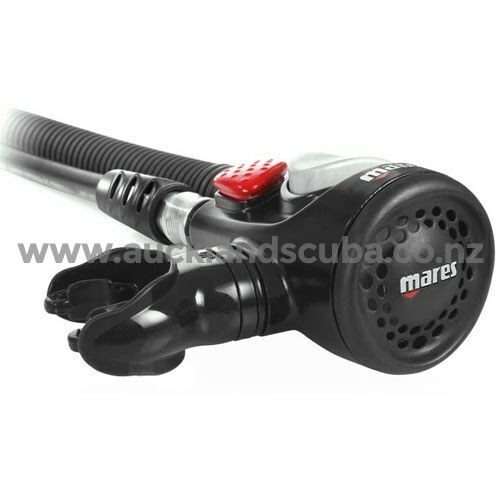 Be a safe diver with the Mares Air Control Breathable Inflator. The pre-oriented mouthpiece makes it usable as a quick and easy octopus. The cover features the mesh-grid system, made of soft material so the purge button is easy to push, even when wearing gloves. The patented mesh design of the second stage cover reduces the pressure of water flowing onto the regulators diaphragm and minimizes free-flow. Even in a strong current it eliminates the need for a knob to de-tune your air delivery system- advance technology through basic physics. All Mares second stages are a reliable downstream valve design and offer the unique patented Vortex Assisted Design (VAD) system. The air bypass tube conveys air to the mouthpiece creating a swirling vortex with a low pressure area in the center that keeps the diaphragm down during inhalation, for very sensitive and easy breathing at all depths. It complies with EC standards and can be assembled easily on any inflator hose. Mares Air Control comes with a limited lifetime warranty.